Acquired from the above by the present owners, October 1989. Martin was born in 1860 in Toulouse, where at the age of 17 he entered the Ecole des Beaux-Arts. He excelled quickly and two years later, after winning their Grand Prix, he moved to Paris to study at the Ecole des Beaux-Arts under academic painter Jean-Paul Laurens. Laurens introduced Martin to the masters of the Italian Renaissance and his study of their works while on a trip to Italy in 1883 infused warmth into his palette and turned his focus to atmosphere. 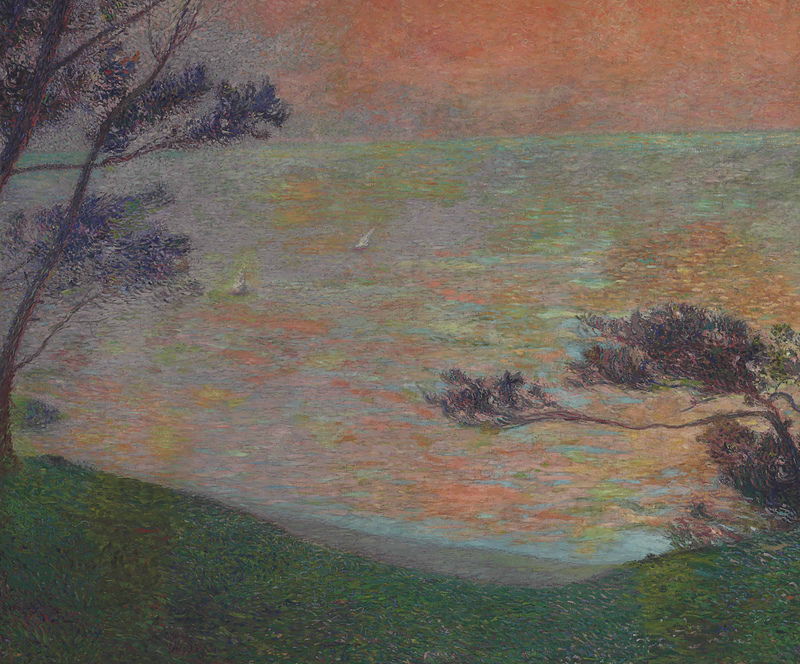 On returning to Paris in 1889, he experimented with the Neo-Impressionist method of Pointillism and by 1898, the Pointillist technique of creating an image through contrasting colored dots was fully integrated into the modern pictorial tradition. In Coucher de soleil au bord de la mer Martin deftly combined it with the classical education he had received in Italy. By the mid-1890s, Martin found great success with solo gallery shows and his popularity as a muralist equaled that of Puvis de Chavannes. Between 1895 and 1896, not long before completing Coucher de soleil au bord de la mer, Martin executed the murals for Paris's Hôtel de Ville. The monumental celebration of nature conveyed by Coucher de soleil au bord de la mer echoes the grand scale of these extraordinary murals. In Coucher de soleil au bord de la mer, a French Mediterranean seascape, Martin placed dots and stripes of color closely together on a thick layer of paint. The texture of the resulting surface is both rigorous and fluid, mirroring the nature of the sea. Two trees frame a beautiful sunset over a wide open sea, while two sailboats bob languidly on the tranquil water. Please note the amended title for this work is Coucher de soleil sur la Méditerranée.